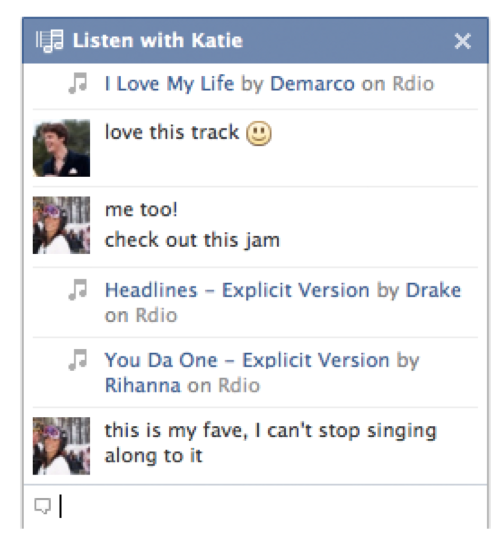 Look out Turntable.fm, Facebook today launches its own simultaneous music listening group chat room feature. New “Listen With” buttons in Chat and news feed stories allow you to select a friend as your personal DJ. When clicked, you’ll instantly launch Spotify or Rdio and start hearing whatever that friend plays in real-time. Other friends can also join your group chat listening room where you can discuss and rave over what you’re hearing, just like if you were listening together in person. Listen With will begin rolling out later today for Spotify users, Rdio will gain support in the next few days, and Facebook plans to add more music partners soon. The new feature will force Turntable.fm to concentrate on public listening rooms and celebrity DJs, as synchronous listening with friends will now be Facebook’s domain. Listen With could significantly increase Facebook time-on-site for the feature’s users, as they’ll need to leave a Facebook browser window open all day to keep the tunes flowing. The feature could boost streaming service signups, because users won’t want to miss out on shared listening experiences with their friends. Previously, I could take your recommendations and listen individually via iTunes, pirated downloads, or a different service. need to have installed the same music appNow I’ll need to sign up for whatever service you’re using to join your “Listen With” room. This could potentially weaken Spotify’s winner-take-all position by getting users to sign up for multiple streaming services. Technical problems stalling Listen With support for Rdio won’t help the browser-based service catch up, though. Facebook already had “Listen” buttons, but they initiated asynchronous playback. While companies always say they’re “excited” for new feature launches, product designer Alexandre Roche was especially enthusiastic. He said Facebook’s internal tests have had “really positive feedback. Everyone really likes it.” When asked if Facebook would roll out a similar feature for video watching through Hulu and Netflix, Roche said that would be cool, “Maybe in the future”. Up to 50 friends can join your listening chat room. As the DJ switches from song to song, everyone will follow along. To discontinue the shared experience, a listener can pause, switch songs, close their music app, close Facebook, or go offline within Chat. The only obvious shortcoming of the feature for now is that you can’t substitute in a new DJ if someone in the Chat room has something they want to play for everyone else. However, migrating a room from DJ to DJ could get messy privacy wise, so it makes sense that switching isn’t allowed. Roche says he’s a fan of Turntable.fm and that there’ll still be a place for it in the listening ecosystem. He thinks “Turntable.fm is more about finding a genre you like” and discovering music from strangers. I think Turntable.fm will need to differentiate itself, because a core use case has been subsumed by a much more widely adopted service. It has its slick graphics, avatars, and gamification, but the utility is much the same. Since Listen With is purely social, Turntable.fm should look to add more discovery features, such as tagging listening rooms by genre for easy browsing. Update: I’m whitelisted and have been trying out “Listen With”. Frankly, I love it. Listen With is a great example of intuitive product design that just works. It brings to fruition the social music discovery and shared experience aimed for with the f8 launch of Facebook Music.